Earlier this week, I wrote a Block Design Tutorial for how to hand draft quilt block ideas. Today, I want to introduce you to a free computer program called Inkscape that creates vector based images. 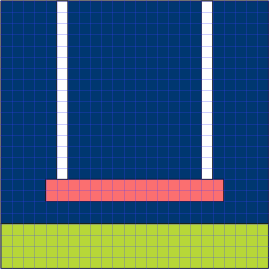 I have been using Inkscape to design on my computer for a few months, and I really like the crisp PNG images that can be created for tutorial images, block design, and quilt design. 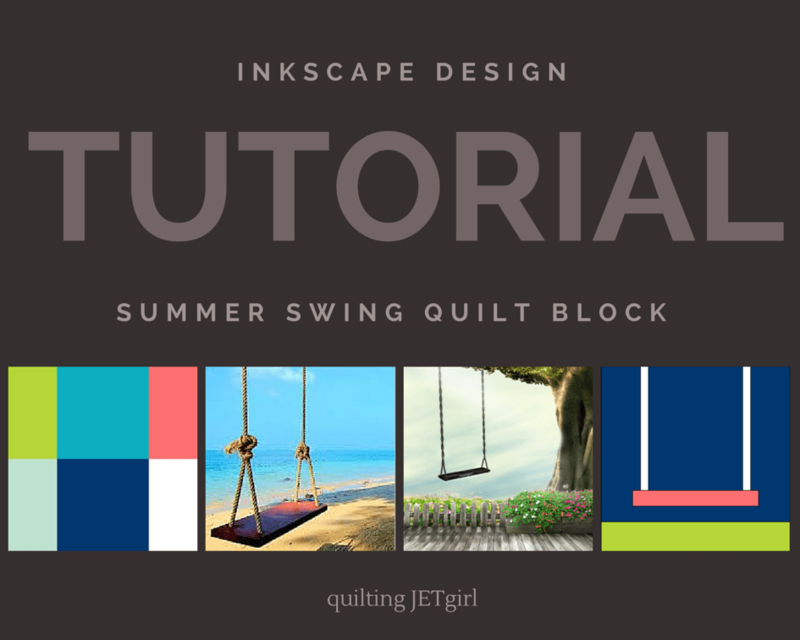 For the video tutorial below, I am working with the 2015 Fabri-Quilt New Block Blog Hop color palette and 2 inspiration images of rope swings within Inkscape to create a 12-inch by 12-inch (finished) quilt block. I hope this gives you some idea of how to interact with the Inkscape environment and helps you decide if it is a software tool that would be beneficial for you to learn. Inkscape – vector-based design program for Macs, Windows and Linux. a semi-clone of Adobe Illustrator. It’s public domain and user-developed which means its developed by random people for free. That means things aren’t always optimal, but it works well if you want to try a vector-based approach. There is a small learning curve if you haven’t used vector software before. We have tips for Inkscape users in the Files section of the group. Hmmm… this is all very interesting, Yvonne. I worry that I might not be technilogically inclined enough to put this program to use, but it’s great to know it’s out there to explore. Very cool program. I’ll have to play around with that, but it certainly would be a fun way to design. I can see the advantages to paper/pencil and electronic. After playing with this, which do you prefer? Or does it depend (as I think it would for me). Why do new computer programs scare me?!! I think the key is to find what works for you and go with it. I need to check it out and play a little bit, if I can get the intimidation fear under control! Thanks for sharing this. I have been beginning to create some designs by hand. Looking forward to trying this out on the computer. Have a great weekend, Yvonne. Nice tutorial! I just starting using Inkscape a couple months ago, and I’m slowly learning how to use it. Great free drawing program! is this program compatible on a MAC? Okay, cool. I think I will try this if it is compatible on a Mac. Great video tutorial; just confused that you seem to have to save and/or export this twice? Once as is, and then the second time to be able to go back to make any changes? Interesting…thanks for sharing. Now to get my creative juices flowing and design a block. Thank you for the tutorial! I need to play around with this program some more to get comfortable with it. I joined the Facebook group as you suggested. Thanks for this tutorial, Yvonne! I’ll give it a go. Thanks for the tutorial, there are so many products out there it is difficult to know which would suit best so recommendations like yours are always helpful. This is slightly scary stuff for a technophobe like me! I have a feeling pencils and paper might win the day round here, but good to know it’s out there in case I do ever have the need. Great to hear your voice on the video – you remind me very much of my cousin in Chicago listening to you. I like that inkscape can be installed on a drive or SD card and you bring it between computers really easily. Do you use this more than EQ? Ooooh I did not know about this! I will have to look into it more when designing my block. This is exactly what I needed!! I’m super behind on reading this post but I’ve been looking forward to watching your tutorial. I’m definitely going to give inscape another try. Thanks!